The traditional Japanese sword of the ancient samurai was the katana. The historical katana featured a curved blade with a single edge and a square or, more commonly, a circular tsuba. Samurai Swords had a long handle which could accommodate both hands. The handle was usually wrapped with cotton or leather. The handle wrap covered a ray skin or Same core. These lightening fast swords were designed to be drawn quickly. They were frequently paired with a companion sword such as a wakizashi or an even smaller, dagger size tanto. Honshu Boshin Double Edge Swords are 40 13/16 inches in all. These swords feature a sharp 30.5 inch 1060 high carbon steel blade. The stainless steel guard and pommel have a satin finish. The comfortable grip is crafted of nonslip TPR for secure handling. The Boshin features a custom wooden scabbard. The scabbard is accented with a real leather wrap. 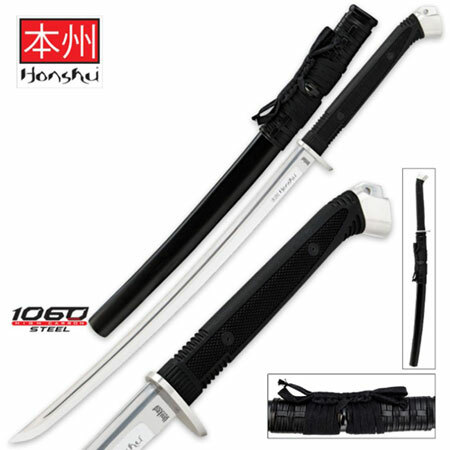 Buy the popular Honshu Boshin Swords for $139.99. Honshu Boshin Wakizashi Swords are 34 inches in all. These swords feature a sharp 22 ½ inch 1060 high carbon steel blade. The stainless steel guard and pommel have a satin finish. The comfortable grip is crafted of nonslip TPR for secure handling. The Boshin Wakizashi features a custom wooden scabbard. The scabbard is accented with a real leather wrap. Buy the popular Honshu Boshin Wakizashi Swords for $99.99. Honshu War Swords are 30 inches in all. These swords feature a sharp 21.25 inch 1060 high carbon steel blade. The stainless steel guard and pommel have a satin finish. The comfortable grip is crafted of nonslip TPR for secure handling. The Boshin Wakizashi features a custom wooden scabbard. The scabbard is accented with a real leather wrap. 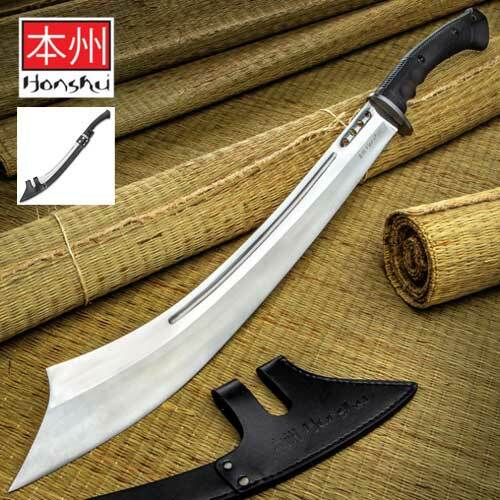 Buy the popular Honshu War Swords for $99.99.